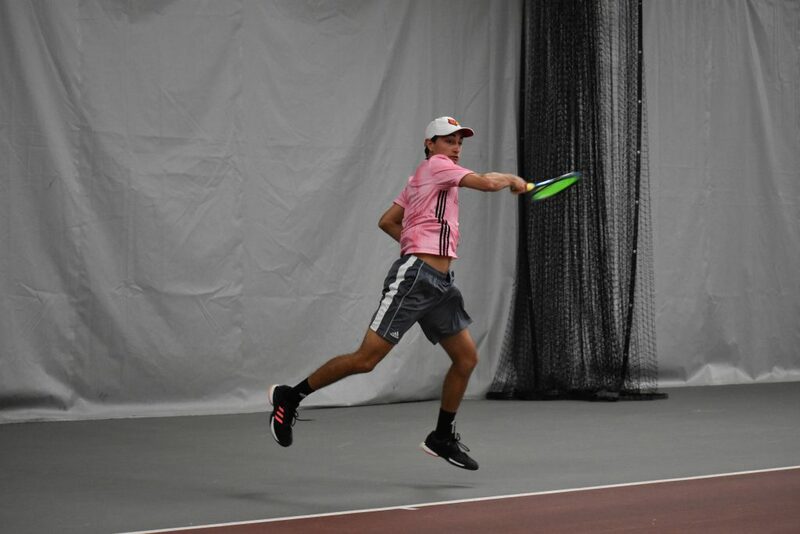 After a devastating loss to Duke, men’s tennis turned things around for the second part of their doubleheader, defeating Illinois State 5-1. They currently hold a 14-9 overall record and 2-6 conference record. The doubles lineup included senior Christopher Morin-Kougoucheff and freshman Fabien Salle at No. 1, senior Federico Gomez and freshman Marcus Sulen at No. 2, and senior Brandon Lancaster and freshman Alex Wesbrooks at the No. 3 spot. Gomez and Sulen finished first at 6-3 over Jorge Quispe and Diego Herrera (IS). Following them, Kougoucheff and Salle completed their match with a winning score of 7-5, securing the doubles point for the Cards. Wesbrooks and Lancaster didn’t get the chance to finish their match. They were up 6-5. The singles lineup included Salle at No. 1, Lancaster at No. 2, freshman Sergio Hernandez at No. 3, Gomez at No. 4, freshman David Mizrahi at No. 5, and Wesbrooks at the No. 6 spot. Kicking off singles, Wesbrooks quickly gained Louisville another point after winning his match 6-4, 6-1. Coming in next was Lancaster with another 6-4, 6-1 win for the Cards. Gomez defeated Jorge Quispe (IS) 6-4, 6-4 to clinch the match. Finishing next was Hernandez (7-5, 6-1) to bring the overall score up to 5-0. Mizrahi fell 7-5, 6-0 to Diego Herrera (IS), giving Illinois State their only point. Salle split sets, but suffered an injury mid-match. The coaches agreed to leave the match unfinished, making the final score 5-1. The Cards travel to play Clemson on Friday, April 5 at 5pm at the Hoke Sloan Tennis Center.